The 39 Steps is a parody adapted from the 1915 novel by John Buchan and the 1935 film by Alfred Hitchcock. The original concept and production of a four-actor version of the story was by Simon Corble and Nobby Dimon. Patrick Barlow rewrote this adaptation in 2005. The play's concept calls for the entirety of the 1935 adventure film The 39 Steps to be performed with a cast of only four. One actor plays the hero, Richard Hannay, an actress (or sometimes actor) plays the three women with whom he has romantic entanglements, and two other actors play every other character in the show: heroes, villains, men, women, children and even the occasional inanimate object. This often requires lightning fast quick-changes and occasionally for them to play multiple characters at once. Thus the film's serious spy story is played mainly for laughs, and the script is full of allusions to (and puns on the titles of) other Alfred Hitchcock films, including Strangers on a Train, Rear Window, Psycho, Vertigo and North by Northwest. The first version of the play written by Simon Corble and Nobby Dimon for a cast of four actors and funded by a £1,000 Yorkshire Arts Grant, premiered in 1995 before an audience of 90 people at the Georgian Theatre Royal in Richmond, North Yorkshire, before embarking on a tour of village halls across the north of England. In 2005 Patrick Barlow rewrote the script, keeping the scenes, staging and small-scale feel, and on June 17, 2005 this re-adaption premiered at the West Yorkshire Playhouse, directed by Fiona Buffini and designed by Peter McKintosh. The featured actors were Robert Whitelock, Lisa Jackson, Simon Gregor and Mark Hadfield. Maria Aitken directed the revised production in its London premiere at the Tricycle Theatre (London), which opened on 10 August 2006 titled John Buchan's The 39 Steps. The cast for the London premiere comprised Rupert Degas, Charles Edwards, Simon Gregor and Catherine McCormack, again with designs by Peter McKintosh. The production transferred to the Criterion Theatre in London's West End in September 2006. The 39 Steps closed on 5 September 2015 after 9 years in the West End, making it the fifth longest running play in West End history. On 27 August 2008 a Spanish production opened at Maravillas Theatre in Madrid directed by Eduardo Bazo and starring Gabino Diego, Jorge de Juan, Diego Molero and Patricia Conde (later replaced by Beatriz Rico). The play premiered the U.S. at the Boston University Theatre, by the Huntington Theatre Company, in Boston on 19 September 2007. Billed as Alfred Hitchcock's The 39 Steps, it opened on Broadway in a Roundabout Theatre production at the American Airlines Theatre, with previews beginning on 4 January 2008 and the official opening on 15 January 2008. The initial run concluded on 29 March 2008 and transferred to the Cort Theatre on 29 April 2008 and then transferred to the Helen Hayes Theatre on 21 January 2009. Aitken also directed the United States productions, with McKintosh designing, and Edwards transferred to these productions as Richard Hannay, the only actor from the UK cast to do so. The other actors in the premiere US productions were Jennifer Ferrin, Arnie Burton and Cliff Saunders. Edwards concluded his run on 6 July 2008 and Sam Robards took over the role of Richard Hannay. Jeffrey Kuhn and Francesca Faridany joined the cast on 28 October 2008. In December 2008 it was announced that Sean Mahon would take over the role of Richard Hannay. The show had its final Broadway performance on 10 January 2010 after 771 performances, "the longest-running Broadway play in seven years" (according to the writer for Playbill.com). The 39 Steps transferred to the off-Broadway venue New World Stages, reopening on 25 March 2010. On April 1, 2015, performances of the play, subtly retitled "39 Steps", resumed at the Union Square Theatre with the entire original creative team, and starring Robert Petkoff as Hannay, Brittany Vicars as the women, Billy Carter as Man #1. Arnie Burton resumed his long-running stint as Man #2; a role he continued until the 'clock' for his tenure reached 1000 performances on September 28, 2015. Mark Cameron Pow replaced Arnie Burton in the role and the production continued performances until January 3, 2016, when the theatre and building were closed for repurposing of the building into creative office space and high-end retail. This production, produced by Douglas Denoff, ran 317 performances to 61,590 ticket holders ranging in age from 5 years to 103, and each received a trademark red nose in honor of the plays' branding "Hitchcock Made Hilarious". A Broadway return for this production is anticipated in 2018-2019. The play won the Olivier Award for Best Comedy in 2007 and the What's On Stage Award for Best Comedy 2007. The 2008 Roundabout Broadway production won the 2008 Drama Desk Award for Unique Theatrical Experience and Outstanding Lighting Design (Kevin Adams). It won two Tony Awards on 15 June 2008 for Best Lighting Design and Best Sound Design. It was nominated for four other Tonys: Best Play, Best Direction of a Play (Maria Aitken), Best Scenic Design of a Play (Peter McKintosh) and Best Costume Design of a Play (Peter McKintosh). The play shares the plot and characters with the film. However, the play is a more comic treatment of the story, in the style of Monty Python and Barlow's own National Theatre of Brent, compared to the original and more serious film. The play incorporates references and use of music excerpts from other Hitchcock films. The cast of four actors portrays between 100 and 150 roles, including actors doubling parts within the same scene. The quick, comic changes are reminiscent of Charles Ludlam's The Mystery of Irma Vep. The actress playing Annabella Schmidt also plays the two other romantic females, Pamela and Margaret, while the two clowns play the nearly all the other roles. The part of Richard Hannay is the only one where the actor does not double in another role in the play. Apart from the transfers to London and Broadway, this lists only the first production in a country. 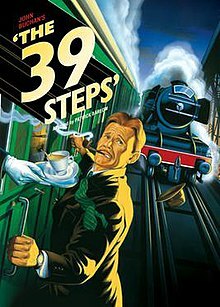 The 39 Steps played for 9 years (2006–2015) at the Criterion Theatre in London's West End. 2017, The Lake Charles Little Theatre, Lake Charles, Louisiana, starring Clay Hebert and Alex Landry. ^ a b c Joel Brown (16 September 2007). "4 actors, 150 roles add up to 39 Steps". Boston Globe. Retrieved 2008-04-04. ^ a b Johnson, Andrew (15 June 2008). "Thirty-nine steps to an unlikely theatrical triumph". The Independent. Retrieved 1 May 2013. ^ Kate Bassett (3 July 2005). "The 39 Steps, West Yorkshire, Playhouse, Leeds". The Independent. Retrieved 2008-04-04. ^ Sam Marlowe (18 August 2006). "The 39 Steps". The Times. Retrieved 2008-03-30. ^ a b Jasper Rees (18 August 2007). "The 39 Steps from Leeds to Broadway". Telegraph. Retrieved 2008-03-30. ^ Lynne Walker (11 July 2005). "The 39 Steps, West Yorkshire, Playhouse, Leeds". The Independent. Retrieved 2008-04-04. ^ Dominic Cavendish (18 August 2006). "Irreverent romp down the nostalgia track". Telegraph. Retrieved 2008-03-30. ^ a b c Ben Brantley (16 January 2008). "Spies, Blonde and a Guy Go North by Northwest". The New York Times. Retrieved 2008-03-30. ^ Brian Logan (23 September 2006). "The 39 Steps (Criterion, London)". The Guardian. Retrieved 2008-03-30. ^ Georgia Snow (17 June 2015). "The 39 Steps to close after nine years in the West End". The Stage. Retrieved 2015-06-23. ^ Louise Kennedy (21 September 2007). "Hitch a ride". Boston Globe. Retrieved 2008-04-04. ^ Robert Simonson (4 June 2008). "Charles in Charge". Playbill. Archived from the original on 8 June 2008. Retrieved 2008-06-14. ^ Kenneth Jones (4 June 2008). "Sam Robards Is the Next Pursued Man of Broadway's 39 Steps". Playbill. Archived from the original on 7 June 2008. Retrieved 2008-06-14. ^ Paul Taylor (15 August 2006). "The 39 Steps, Tricycle Theatre, Kilburn, London". The Independent. Retrieved 2008-04-06. ^ Gates, Anita. "Revisiting a Thriller, Revised as a Farce". www.nytimes.com. The New York Times. Retrieved 10 April 2016. Wikimedia Commons has media related to The 39 Steps (play). This page was last edited on 24 April 2019, at 18:59 (UTC).